Last week City Parks Commissioner Adrian Benepe cut the ribbon on a short stretch of waterfront greenway connecting 83rd and 91st Streets. The path is the final link in a pedestrian path stretching 12 miles from Battery Park to Dyckman Street. The long-awaited extension eliminates the need to take a half-mile detour through Riverside Park that has for years confounded strollers, rollerbladers, skaters, runners and bikers making their way along the river. Mayor Bloomberg was among those credited with bringing the uninterrupted greenway to completion by allocating funds for most of the nearly $16 million project. Is it possible to live plastic-free? And why bother? Because the plastic bag or bottle that doesn’t make it into a trash bin could end up washing down a storm drain and in the Hudson River. 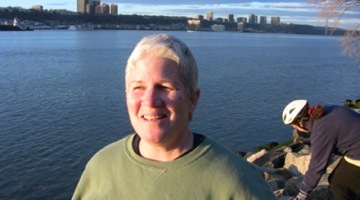 In this short video, a plastic-free lifestyle advocate talks about her effort to live plastic-free in NYC. “Naa Yanga” used with the permission of Benjamin Robert Tubb of Public Domain Music (www.pdmusic.org.). I recently spotted a yellow bird while biking along the Hudson River. The little fella really stood out against the rocks where he seemed to be contemplating a flyover to New Jersey. I was part of a small group that gathered to watch him. After about 20 minutes, I decided to climb over the rocks to try and grab him, figuring that if I didn’t, he’d either drown or be eaten by a hawk. It took a couple of swats to get a hold of him. He put up an impressive struggle–distressed animals, no matter how small, can be surprisingly strong –and tried to take the tip off my thumb. I managed to cover him with a scarf, put him in the basket on my bike and to take him to a local bird clinic. Rescuing a bird is something that stays with you and I thought about him a lot during the following week, even going so far as to name him Rocky. When I went back to the clinic to check on him, I found out Rocky was a female peach-faced Lutino lovebird, only a couple of months old. After a few tests, she was deemed to be healthy and put up for adoption. True to her name, Rocky got off to a rough start. The initial adopter couldn’t keep her and she subsequently spent a solitary stretch in a holding area at the bird clinic. The vets grew concerned when her appetite began to wane and she stopped grooming herself. 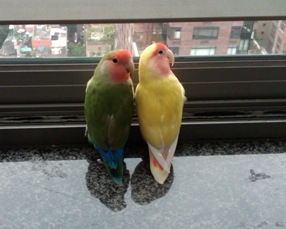 Then she was paired with another lovebird. Before long they hit it off and Rocky was on the road to recovery.